Today we dodged a bullet, or should I say a storm. When were in Giddings, TX last week, we decided that we spend an extra day at the Rainbow Plantation in Summerdale, AL. Today is that extra day. Today is the day we would have been on the road at the time a major storm would make it’s way across the Southeastern states. We would have been in the middle of a storm system that brought heavy rain, strong winds and tornado warnings to the region. Here is the storm report from the weather channel. Fortunate for us, God’s providence kept us safe today. Instead of traveling, we took a day of R and R. On recommendation from Darrell/Judy from Wandering America , we went to breakfast at the Foley Coffee Shop. Stepping into the front door is like stepping back in time. The small cafe has an open kitchen with bar style counter on the left, one row of tables in the center, and a row of booths on the right. Folks are friendly, food is great and service will assure satisfaction. Next we headed to Walgreen’s to refill a prescription. They said to check back in about 1 hour. Let’s see, I think we will go to Walmart. Bought a lock that we needed, forgot the long extension power strip we really needed. Then fueled up at $3.89 at Dodge’s. They sell fuel and Fried Chicken – must be a southern thing. While fueling, a fella there said the folks up on I-10 were getting hit pretty hard from the storm. Made me thankful for our day of R and R. Got back to Walgreen’s and waited a few more minutes before meds were ready. Drove through some light sprinkles as we headed back to the Plantation. We walked Cody & Qianna. Then waited a few minutes for Darrell and Judy to come by. We originally planned a breakfast with them. They had errands to run first so we agreed on lunch instead. They would drive us to Fairhope, AL. Lunch would be at Panini Pete’s, one of those Diners, Drive-ins, & Dives places. Panini Pete’s is located in the French Quarter area of downtown Fairhope. I had their Junkyard Dog Chicago Style hotdog with a site of Frites while Carol had a bowl of Cream of Cauliflower soup with a side of home made chips. Food was very good. Joining us for lunch were Mike and Peggy who blog at Maineiacsinmotion. We enjoyed a great meal with our new friends. That is Mike and Peggy on the left. Judy and Darrell are across the table. After we got back to the Plantation, we stopped by Darrell and Judy’s home to meet, Alex and Katie. They were not sure of us humans intruding on their space but they soon got over that. Carol and Judy chatted about Judy’s quilting and crafting corner while Darrel and I chatted about the tech stuff. Then we walked over to our home so they could meet our fur babies and get the grand tour of our home. It was an enjoyable afternoon meeting new friends putting real faces on bloggers we read. We decided we needed to get the laundry done before we leave on Saturday. We do have a small washer/dryer in our home but sometimes it is just quicker to sit for a couple of hours in a laundromat. OOPS, where are our quarters. While Carol got the wash started with the quarters we had in our pockets, I walked over to the Plantation office to get change. Carol read and I worked on this posting. The dryer has stopped and Carol said it was time for me to fold. I’ll be right back. Clothes are folded and put away. Carol and I have a hunger for Pizza. We could do something safe like Pizza Hut but that is not our style. Time to find a local pizzeria and hope for success. We found Papa’s Pizza. OK, they area a chain pizzeria. They have a few stores. They were new to us so they qualified as “a place we have not been to before”. 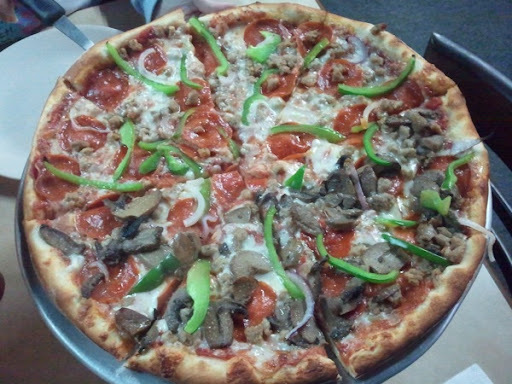 Our Rocky Marciano pizza was very good. The kind of good that produces a WOW when you get that first bite. Take a look. If you have a monitor with smell-o-vision, you will understand. We are finally back home now, rested from a busy day. Thanks for stopping by. Tomorrow we head for Montgomery, AL. Who knows what will find there. This entry was posted in Alabama and tagged Road Trip, RV. Bookmark the permalink. You have certainly given us some good choices of eating establishments when we return to Summerdale. The only place we ate at when we visited there a couple of years ago was Lamberts — where they throw the rolls. They serve you a LOT of food! Glad you were safe as the storm rolled by. Continue to be safe and God bless! Love that mural on the outside of the coffee shop…very colorful. Glad you missed the storm. I am glad you and Carol are safe from the stormy weather! That scares me and I worry about that when traveling with our fiver….